Having our office so close to Disney means it’s hard NOT to be inspired dressing the little ones! Next week, our grand daughter will be coming back for a visit to see us as their parents, my son and wife, go to witness the wedding of another set of Disney employees who met – just like they did – at Disney. It will be during this trip that I hope to remind them that living 3000 miles away is NOT as much fun as living close by. And of course, that means my little munchkin will wear our Cinderella inspired flower girl dress for the day because EVERY little girl should be wearing Swarovski Crystals. 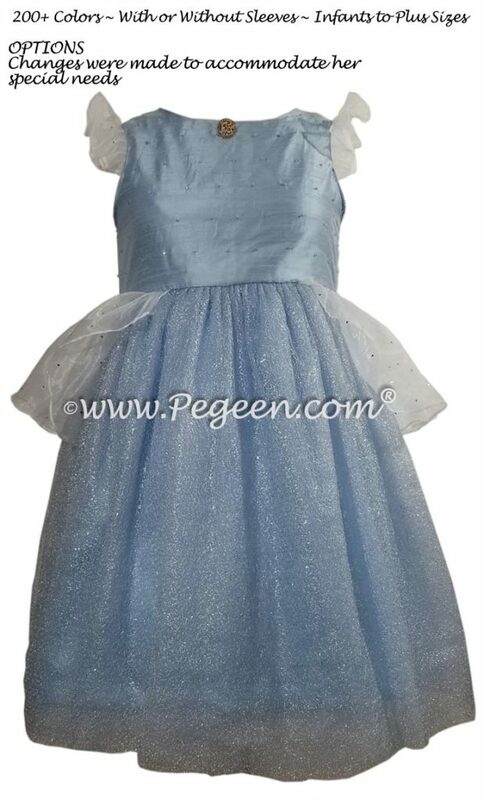 I will likely lose that point but at least I can dress Holly in her newest dress, a Cinderella Dress. It is going to be hysterical because she is now walking so having our little munchkin walking around in her Disney princess dress made by my company will make me so, so proud beyond measure. We recently made one for a very special and beautiful little munchkin who is “differently abled” and had it ready for pick up the same day. We do this often for these Special Needs angels who really steal our hearts. Disney merchandise doesn’t accommodate these special children (however, they are allowed to wear costumes even at older ages). We believe that even a girl who is Special Needs in her mid-thirties or a plus size little girl should still get to wear her favorite princess dress… and been doing so for transplant girls too who, because of steroids, tend to blow up, as well as various other children with special circumstances. This was before we added her crinoline and cameo and of course, pixie dust. Her mom used a term I never heard before, Differently Abled….. I just can’t wait to see her in her dress. If you have questions, or need help to make your Princess’s day, contact us! Please call for appointments.